Nowadays, there are all these apps and sites that allow you to read anything, anywhere, straight from your devices. But if you ask me, nothing compares to the experience of holding a book in your hand and flipping through the pages wondering what exciting adventures and ideas will the next page bring you. Traditional, old-fashioned books have a certain charm to them, which is why they will never go out of style. Sure, they might not be as popular as an eBook nowadays, but for people who love to read, they will always be the better option. Pippa Branham and her husband love books so much that they couldn’t just settle on having a bookcase in their home. The couple actually decided to decorate their new home so that it will unveil their passion for books. 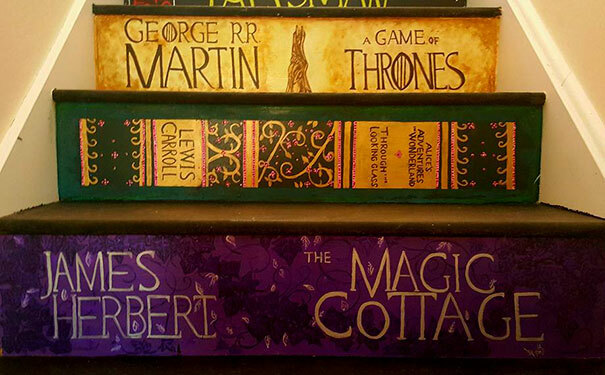 They decided to turn the staircase into a one-of-a-kind book collection that is sure to impress all of their guests. 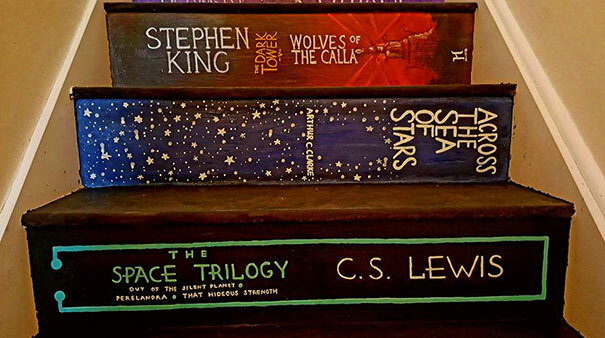 Inspired by a project she found on Pinterest, Pippa painted the stairs so that it would resemble her family’s favorite books. After she made a list of all the books she wanted to recreate, she bought some supplies and got to work! The result is awesome! Check it out! Previous article I Saw Him Lying Over A Joystick. When The Camera Panned Out? You Won’t Believe Your Eyes..